Ottawa has more than its fair share of public statuary and monuments. I've been waiting for the right weather to photograph the war memorial, and one misty evening in a late December thaw, that moment finally came. 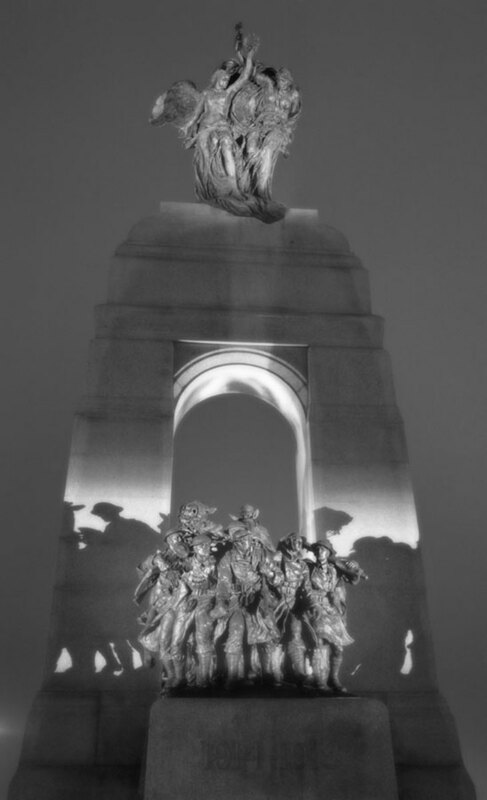 The War Memorial was originally erected to commemorate a time when one in ten Canadians was in uniform, and one in ten combat troops never came home. There's a tension in the sculpture. While winged victories bestride the height of the monument, it's a saddened, grimly burdened lot that press through the narrow arch. Their numbers are too great. These, clearly, are the dead.